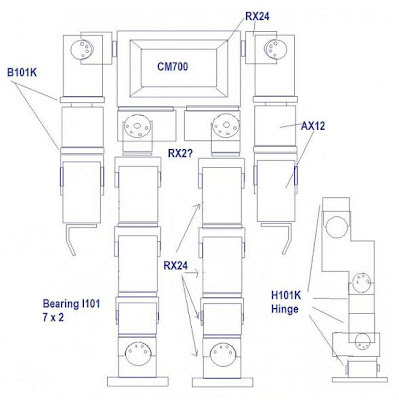 I have been thinking about building my own robot for many months. The idea is to build a stronger robot using RX type servos. I am not into vision and camera but a nice robot like the Melissa. I like a fancy robot like the Kondo Khr3 and do creative things with it and not only fighting. Havimo maybe later. I thought about cutting my brackets and how to get the best deal to do this. I bought some tools to cut and bend aluminium. I cut a piece for the robot arm and I find that having to do this for 30 times is not an easy task. Occasionally I draft my idea onto my iPad. Few days ago I finally put something together on Paint then send it to my friend Andrew Alter. And guess what he turn it into a 3D design for me very quickly. The result below is amazing!! 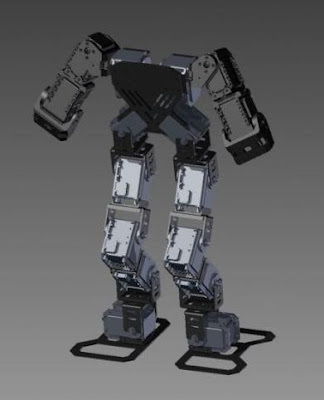 We discussed on gtalk over several days and came up with using RX24 for legs and shoulder only and AX12 for the arms. It will use a CM700 since the CM500 won't be able to talk to the RX24. The height of this is 36cm similar to my Bioloid Type K except that it is twice as strong. I be using off the shelf brackets from Troussen Website. Plus 12x RX24, 6x RX12, CM700. We calculate the cost is around 2K to 2.5K USD. A KHR3 would cost $1500 excluding remote control etc. So it is more expensive but this is twice as strong. With the strong legs it can really do good Kung Fu moves. If the legs aren't strong enough then it will wobble and make it hard to balance a kick and fall down. I wonder it can jump pls let me know if you have put rx24 to a robot and if it can jump. I am happy with using Robotis control board CM700 and not other more power board is because it is proven compatible with Bioloid Servos, plus I am already very familar with RoboPlus. So I am just waiting for the finalise design then off they be ship to me and to my surprise the shipping cost is not an arm and a leg to HK. Then all I need to do is just screw the servos and brackets together wire them up then off we go. Ya it is getting a head. I am either looking for a terminator skull or make something out of aluminum or get a gundam head. Know where to get a terminator head? I am not a Gundam fan. I need to visit Toys'r US again. Hi Martin, what robot you have ? any youtube vid ?